97OKK Jimmie Rodgers Singer/Songwriter Competition! 97OKK Jimmie Rodgers Singer/Songwriter Contestants! What do Elvis Presley, Faith Hill, Randy Houser, Paul Overstreet, and Hayley Williams have in common? THE JIMMIE RODGERS SINGING COMPETITION! 97OKK is bringing this iconic event back and we want YOU to be a part of it! Recording studio time provided by Blue Sky Studios! 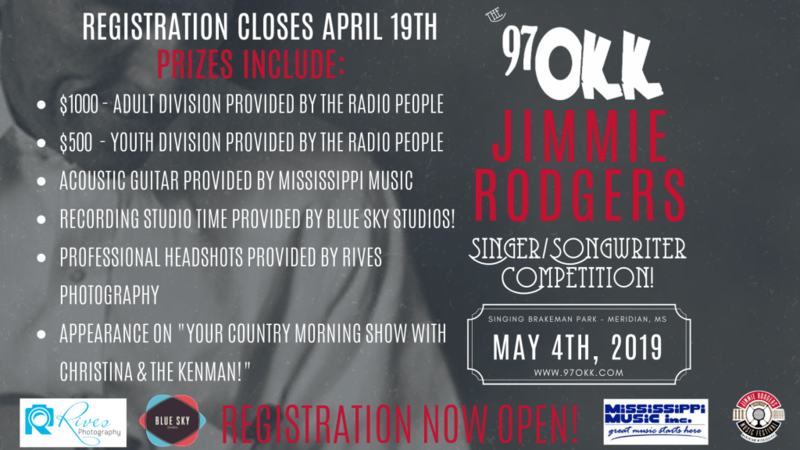 Want your chance to take the stage at the 97OKK Jimmie Rodgers Singer/Songwriter Competition? Create a video of contestant singing. The contestant can sing an original song or they can do a cover song. Video can range from shot with a cell phone to a produced video. This is a singer/songwriter competition. No pre-recorded tracks will be accepted. Click the link below and follow the prompts to register. Registration is open from March 18, 2019, through April 19, 2019. Voting opens April 22, 2019, and will continue through April 28, 2019.